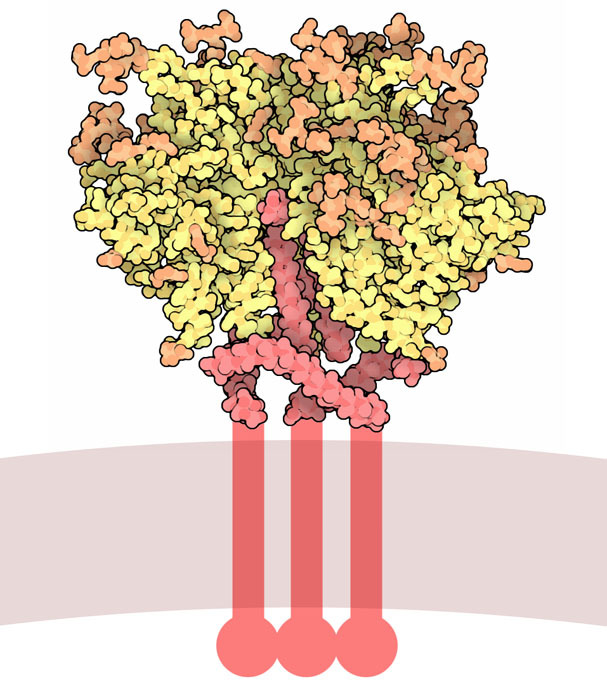 HIV envelope glycoprotein, with the membrane-spanning portion shown schematically at the bottom. Viruses are faced with a tricky problem: they need to get inside cells, but cells are surrounded by a protective membrane. Enveloped viruses like HIV and influenza, which are themselves surrounded by a similar membrane, solve this problem by fusing with the cell membrane. 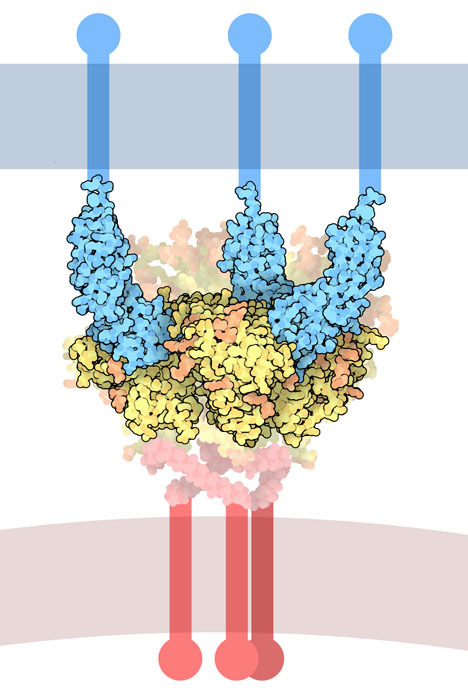 The envelope glycoprotein (Env) of HIV performs the many complex steps needed for membrane fusion. First, it attaches itself to proteins on the surface of the cell. Then, it acts like a spring-loaded mousetrap and snaps into a new conformation that drags the virus and cell close enough that the membranes fuse. Finally, the HIV genome is released into the cell, where it quickly gets to work building new viruses. The Env glycoprotein is found on the surface of HIV, forming little knobs composed of three identical subunits. It is covered with carbohydrate, with about 81 glycosylated sites on each trimer. It is encoded in the HIV genome as one long protein, which is called gp160 (gp is short for "glycoprotein"). Then, as it is transported to the infected cell's surface, the many carbohydrates are added and it is cleaved into two pieces, called gp120 and gp41. Then, it is incorporated into the virus as it buds from the cell surface. The HIV Env glycoprotein has been particularly difficult to study for several reasons: it is covered with flexible carbohydrates, it is normally bound to membranes, and it is intrinsically flexible, since it needs to adopt several different shapes during the process of membrane fusion. Researchers have solved this problem by cutting off all the flexible and sticky bits and studying the rigid core of the molecule. The structure shown here, from PDB entry 4nco , is one of the most complete structures solved so far. It includes gp120 (yellow) with lots of carbohydrate (orange), and the outer portion of gp41 (red). The same molecule has also been studied by electron microscopy in PDB entries 3j5m and 4cc8 ). The structures also have broadly-neutralizing antibodies bound to Env (not shown here) that are being studied for vaccine design--these will be discussed in more detail next month. HIV envelope glycoprotein (bottom) recognizing CD4 proteins on a target cell (top). The gp120 portion of Env glycoprotein is in charge of finding cells and attaching to them. It binds selectively to CD4 protein (shown here in blue), which extends from the surface of cells. Then, a shift in the shape of gp120 allows it to bind to a second cellular co-receptor, strengthening the attachment and leading to the fusion event. An early structure, from PDB entry 1gc1 , revealed the interaction of CD4 with gp120 by using a truncated form of the viral protein, which had several of the flexible protein loops shortened to something more manageable. The illustration shown here was created by overlapping this groundbreaking structure onto the more recent structure of the trimer, showing how the whole thing might be situated during the process of attachment. The gp41 portion of Env glycoprotein gets the virus inside the cell after gp120 attaches to the surface. As with the influenza hemagglutinin protein, a large change in the shape of the protein is thought to drag the viral membrane and cell membrane into close proximity. The formation of a distinctive helical bundle is important in both viruses, as shown on the left in a structure of the extracellular portion of the SIV gp41 protein (PDB entry 2ezo ). Researchers have developed new drugs that target this interaction and mimic part of the helical bundle, blocking the formation of this important structure. 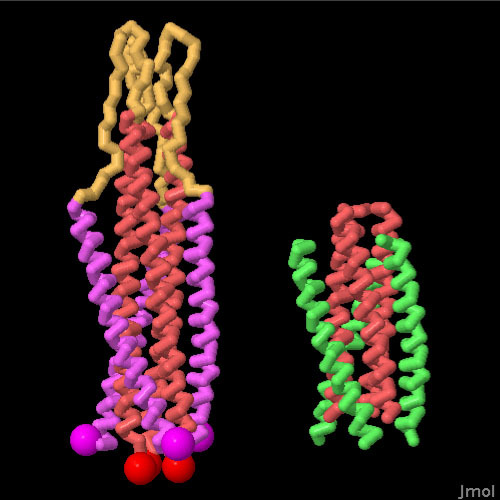 The image on the right shows one of these drugs (in green) bound to the inner bundle of gp41 helices (in red), from PDB entry 3vie . To explore these structures in more detail, click on the image for an interactive jmol. Many structures for fusion-inhibiting drugs are available in the PDB--try searching for "HIV-1 fusion inhibitor." 4nco: J. P. Julien, A. Cupo, D. Sok, R. L. Stanfield, D. Lyumkis, M. C. Deller, P. J. Klasse, D. R. Burton, R. W. Sanders, J. P. Moore, A. B. Ward & I. A. Wilson (2013) Crystal structure of soluble cleaved HIV-1 envelope trimer. Science epub ahead of print. PMID 24179159. 3j5m: D. Lyumkis, J. P. Julien, N. de Val, A. Cupo, C. S. Potter, P. J. Klasse, D. R. Burton, R. W. Sanders, J. P. Moore, B. Carragher, I. A. Wilson & A. B. Ward (2013) Cryo-EM structure of fully glycosylated soluble cleaved HIV-1 envelope trimer. Science 342, 1484-1490. 4cc8: A. Bartesaghi, A. Merk, M. J. Borgnia, J. L. S. Milne & S. Subramaniam (2013) Prefusion structure of trimeric HIV-1 envelope glycoprotein determined by cryo-electron microscopy. Nature Structural and Molecular Biology 20, 1352-1357. 3vie: X. Yao, H. Chong, C. Zhang, S. Waltersperger, M. Wang, S. Cui & Y. He (2011) Broad antiviral activity and crystal structure of HIV fusion inhibitor sifuvirtide. Journal of Biological Chemistry 287, 6788-6796. M. Caffrey (2011) HIV envelope: challenges and opportunities for development of entry inhibitors. Trends in Microbiology 19, 191-197. M. A. Checkley, B. G. Luttge & E. O. Freed (2011) HIV-1 envelope glycoprotein biosynthesis, trafficking and incorporation. Journal of Molecular Biology 410, 582- 608. 1gc1: C. D. Rizzuto, R. Wyatt, N. Hernandez-Ramos, Y. Sun, P. D. Kwong, W. A. Hendrickson & J. Sodroski (1998) A conserved HIV gp120 glycoprotein structure involved in chemokine receptor binding. Science 280, 1949-1953. 2ezo: M. Caffrey, M. Cai, J. Kaufman, S. J. Stahl, P. T. Wingfield, D. G. Covell, A. M. Gronenborn & G. M. Clore (1998) Three-dimensional solution structure of the 44 kDa ectodomain of SIV gp41. EMBO Journal 17, 4572-4584.